Steven Spielberg had a momentous task with War Horse -- adapting an adored play based on a beloved book. The play is a multimedia emotional powerhouse. But this is Steven Spielberg. The War Horse movie experience must be seen on the big screen. Spielberg, as is often the case, paints with a broad canvas. War Horse begins innocently. Jeremy Irvine is Albert, a young man whose father (Peter Mullan) is scarred by the Boer Wars. Albert's dad rents a small farm in a picturesque village in northern England. At a horse auction, Mullan spends his month's rent on a horse that is not the type of beast he needs to plow his farm's rocky terrain. Something speaks to him about the animal. He has to have him. Upon arriving home, his wife (Emily Watson) will have none of it. Albert steps in and commits to train the horse he now calls Joey. 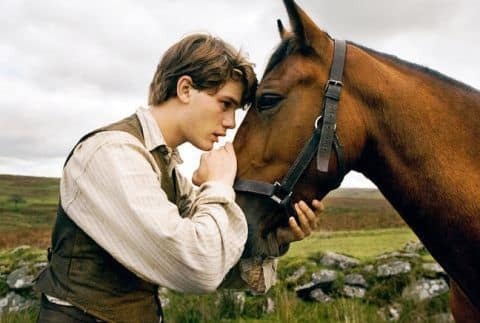 Thus begins the heartwarming connection between man and horse theme that rides like a stallion through War Horse. The war part of War Horse also arrives around this time. Albert is too young to serve in the battle against Germany. But Joey isn't. Before we know it, Albert is separated from Joey and vowing to keep their time apart short. "I will find you," he tearfully says. War Horse then becomes a war movie in many ways. Spielberg swears he doesn't see his film as that type of flick. But the audience does get a front-row seat into World War I from all sides: German, French, English and horse. We see what Spielberg is saying. Even during the war-set action, the stories circulate around the horse and the lives he touches. The film is less about the bullets and the bombs as much as the unique brotherhood between human and horse. And in that vein it succeeds beyond compare. The film is a different beast than the stage show. Anyone that has been blown away by the astounding theatrical experience will find a couple of changes in the Spielberg movie. Of course, instead of puppets audiences witness a real horse (technically 14!). There are also plot changes that were made for the film that don’t necessarily work better, but they still work. Something Spielberg does so well is wrap history in entertainment. As the last of the World War I veterans succumb to old age, films such as this one are increasingly important. Although the audience never learns the cause of the First World War, the experience is seen through the eyes of those who fought it. As such, Spielberg effortlessly shows that although battle tactics and methods may have changed with time, the horror and valiancy experienced by the soldiers has remained the same. War Horse is one powerful piece of filmmaking. It is all Spielberg, from its sweeping atmosphere to the emotional connections he has classically crafted for decades between the audience and his characters. Gentlemen, it is an honor to ride beside you. Make the Kaiser rue the day he crossed swords with us. Let every man do himself, his King, his country, and his fallen comrades proud. Be brave. Wherever you are, I will find you and I will bring you home. Permalink: Wherever you are, I will find you and I will bring you home.